Muslim Saleem reciting his ghazals at Jashn-e-Muslim Saleem at MP Urdu Academy, Bhopal on December 30, 2012. 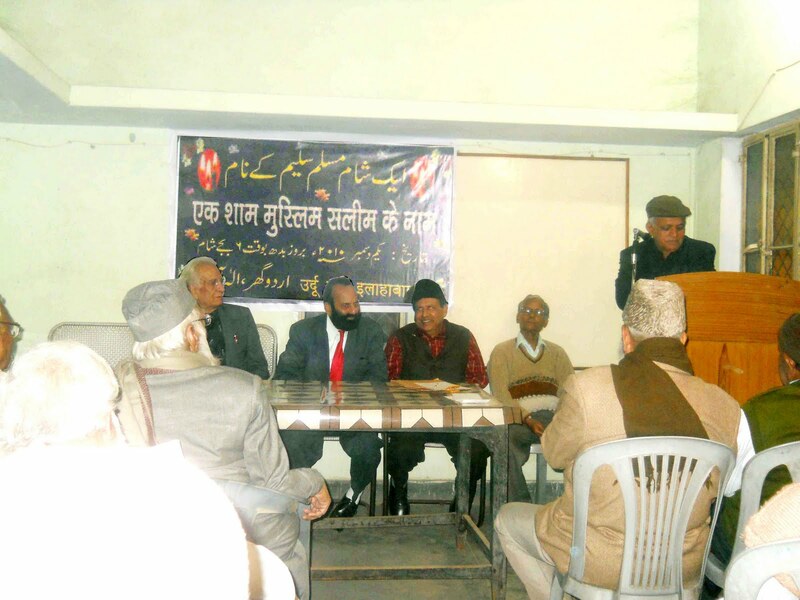 From Left) Zafar Naseemi, MP Urdu Academy Chairman Saleem Qureshi, Dr. Barqi Azmi, Prof Afaq Ahmad, Dr. Qasim Niazi, Muslim Saleem at Jashn-e-Muslim Saleem at MP Urdu Academy, Bhopal on December 30, 2012. Muslim Saleem has been nominated as Patron of Indo-Kuwait Friendship Society along with Kiran Bedi and other luminaries). 1. www.khojkhabarnews.com 2, www.muslimsaleem.wordpress.com 3. www.urdunewsblog.wordpress.com, 4. www.khojkhabarnews.wordpress.com. (Life) Muslim Saleem was born in 1950 at Shahabad, Hardoi, Uttar Pradesh in India, brought up in Aligarh, and educated at Aligarh Muslim University. He is the son of the well-known Urdu poet Saleem Wahid Saleem. He has lived in Bhopal, India since 1979. (Education): Muslim Saleem studied right from class 1 to BA honours in AMU schools and University. He completed his primary education from AMU Primary School, Qazi Para Aligarh (Now converted into a girls school of AMU). He passed high school exam from AMU City School, Aligarh and B.A. Hons (Political Science) from Aligarh Muslim University Aligarh. Later, Muslim Saleem did M.A. in Arabic from Allahabad University during his stay in Allahabad. 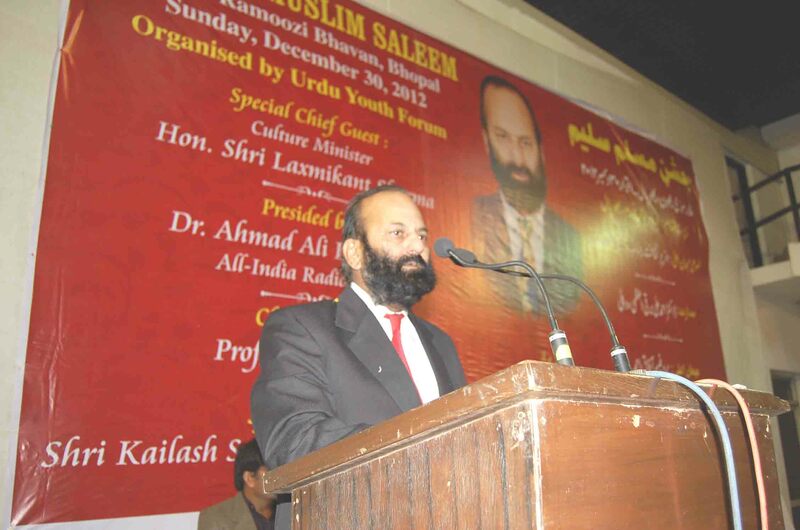 (Career) Muslim Saleem began his career as a journalist in the Urdu-language newspaper Aftab-e-Jadeed, Bhopal. He is multilingual journalist having worked on top posts with Dainik Bhaskar (Hindi), Central Chronicle (English), National Mail (English), News Express (English) and most recently as the chief copy editor of the Hindustan Times in Bhopal. At present, Muslim Saleem is English news advisor to Directorate of Public Relations, Government of Madhya Pradesh. (as on December 1, 2012). (Works and awards) Muslim Saleem has been appointed as Patron of Indo-Kuwait Friendship Society. He is the author of Aamad Aamad, a compilation of his poetry published by Madhya Pradesh Urdu Academi. Several of his couplets are well known in the Urdu language. He won the Yaad-e-Basit Tarhi Mushaira, a poetry competition, in 1982. In 1971, Muslim Saleem was awarded by Ismat Chughtai for his Afsana “Nangi Sadak Par” at AMU Aligarh. His ghazals and short stories have been published in Urdu-language publications Shair, Ahang, Asri, Adab, Agai, Naya Daur, Sada-e-Urdu, Nadeem and other periodicals and magazines. His work in service of the Urdu language was recognized in a special 2011 edition of the periodical Abadi Kiran, devoted to his work. Evenings in his honour have been organised in a number of cities. Muslim Saleem is currently compiling a massive database of poets and writers of the Urdu language, both historic and currently active. 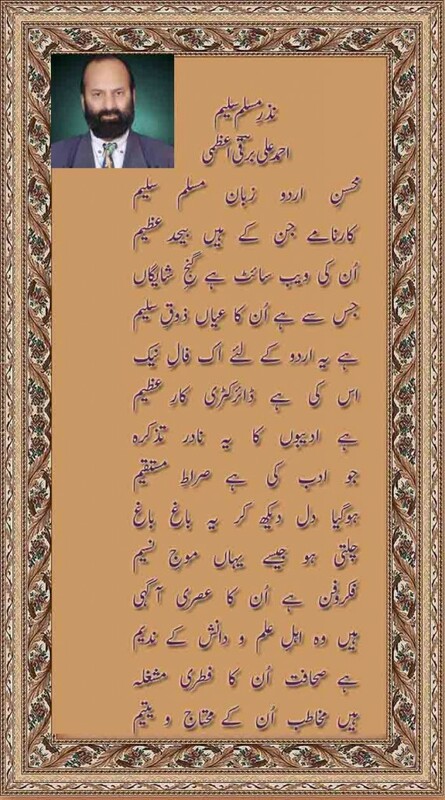 (Translation of Muslim Saleem’s work in English): Great scholar Dr. Shehzad Rizvi based in Washington has translated Muslim Saleem’s ghazal in English even though they have never met. Dr. Rizvi saw Muslim Saleem’s ghazals on websites and was so moved that he decided to translate them. 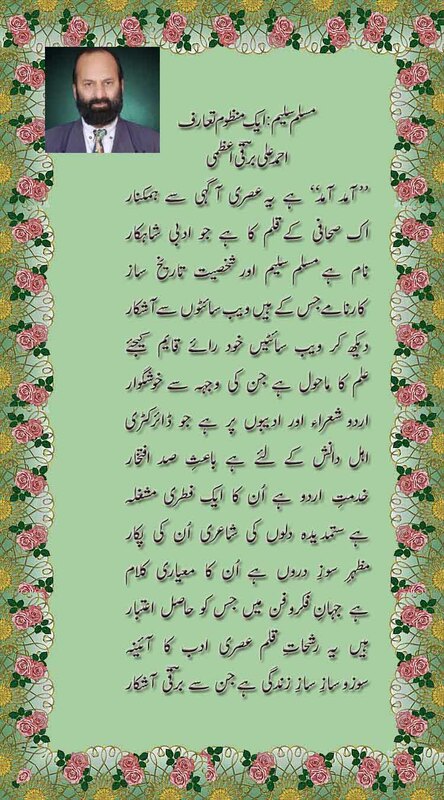 (Praise by poets and writers) Great poet and scholar of Urdu and Persian Dr. Ahmad Ali Barqi Azmi has also written a number of poetic tributes to Muslim Saleem. Dr. Azmi and Muslim Saleem are yet to meet face to face. Beside this, great short-story writer and critic Mehdi Jafar (Allahabad, Bashir Badr (Bhopal), Jafar Askari (Lucknow), Prof. Noorul Husnain (Aurangabad), Kazim Jaffrey (Lahore) and a host of others have written in-depth articles defining Muslim Saleem’s poetry. (Muslim Saleem on other websites) Muslim Saleem’s life and works have been mentioned on Wikipedia, www.urduadab4u.blogspot.in, www.urduyouthforum.org and several other website. In fact, www.urduyouthforum.org has given credit to Muslim Saleem for lifting a number of pictures and entries from Muslim Saleem’s websites and blogs. 11. drama world of india. Muslim Saleem is totally impartial in compilation of these directories. Anyone can help him in compilation and expansion of these blogs and directories by sending brief biographies in English, pictures and articles of himself and various poets and writers of Urdu. Being originally inhabitant of Rajasthan n Urdu poet residing in Mumbai ,It’s always fantastic to be associated with Urdu academy of Rajasthan. 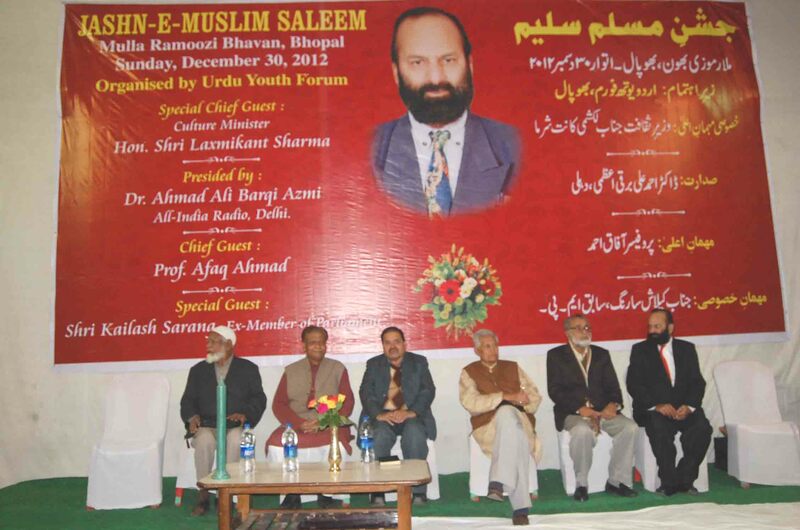 Allahabad University Urdu dept head Prof AA Fatmi introducing Muslim Salleem at Ek Shaam Muslim Saleem ke Naam on December 1, 2010, On stage. BBC ex-announcer Yawar Abbas Rizwi, Muslim Saleem, MA Qadeer, Fazle Hasnain are also seen.